STILL ROOM ON THE BUS to see the Cherry Blossoms in DC at their peak on Tuesday, April 9. Leaving from Pea Neck Rd. in St. Michaels at 7:30 and picking up next to Kohl's in Easton at 7:45. We'll be visiting the Tidal Basin/Cherry Blossoms and then heading over to the National Mall for a day of visiting the Smithsonian Museums, the National Gallery, the National Monument all the other historic and fantastic exhibits and gardens. Cost is only $45 for round trip coach fare. We will depart DC at 4pm. CALL now to join us before we're sold out!!! 410-745-6073. After school and summer programs remain SMCC's top priority. Low-cost registration and scholarships available. There is something for everyone at SMCC. Classes are held throughout the year, including: cooking, Wii bowling, bike riding, and movement class depending on availability of instructors. We have the Daffodil Parade coming up in March. In April we will be doing our Holiday Dinner. We also have 2 paint nights, one in February and one in April. In May we will be doing a Spring Fling. Please stay tuned for details. Treasure Cove Thrift Shop is run by Karen Moaney and a great group of community volunteers. Our little store is always in need of clean, in-season clothing, gently used furniture and usable household goods. 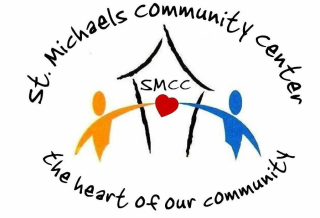 Every penny we earn from your donations goes toward underwriting the programs and operating expenses of the St. Michaels Community Center. ​We also use donated goods to help our community in times of extreme need; such as homelessness, fire, flood, etc.